Dan spent 8 summers during high school and college working in youth camps, facilitating challenge courses, and leading backpacking and canoeing trips. 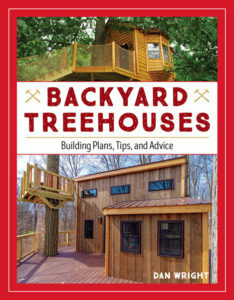 After a few years of building ground houses, he caught the tree house bug in 2003 and he started Tree Top Builders, which now travels the country building treehouses for private and public clients. Fast forward to 2009, he realized that there were a fair number of people who wanted to build their own treehouses, but wanted his support and expertise. That was the beginning of Treehouse Supplies. Fast forward again to 2014, with business doing well and a disturbing lack of awesome public treehouse destinations on the east coast, the time had come for Treehouse World. Dan is driven to accept new challenges and create new and amazing things. The vision for Treehouse World was to give people everything that treehouses signify - freedom, creativity, imagination, and adventure. All of this without needing a yard, or a yard with a tree, or a yard with a tree and a small fortune to hire a custom treehouse builder. Dan does a little of everything at Treehouse World. As an ISA certified arborist, Dan cares for the trees on the property. 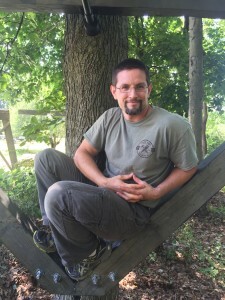 When Treehouse World is open, Dan helps people put their harnesses on for activities, leads woodworking classes, teaches tree climbing, or he may be out building the next treehouse, bridge, or adventure activity somewhere in the acres of woods. Dan has an amazing family with Amy and their 3 boys and a rabbit and a groundhog (the groundhog really doesn't have permission to live under their foundation). They enjoy wilderness canoe camping trips in their 17' Penobscot; which any year now, with growing kids won't be big enough for 5 people and coolers and tents and fishing poles, which might mean a second canoe. They also read books aloud together, go swimming, and travel to some of Dan's construction sites together (the boys are almost old enough to help with carpentry). The boys homeschool with Amy and some local coop groups. The boys also want to be Ninjas when they grow up. They'll probably change their minds.